The second-largest city in South Korea, Busan hosts everything from a world famous collection of hot springs to the world famous Pusan International Film Festival, held each fall. Busan is the coastal flipside to inland Seoul and it continues to compete with the capital, having launched a Summer Olympics bid for 2020. The capital of South Korea, Seoul is a thriving city that skillfully blends old traditions and style with modern culture. Seoul is simply bursting with interesting attractions and visitors will be able to explore ancient palaces, temples and historical sites, which are situated alongside modern amusement parks, aquariums and science centers. The Seoul shopping scene is a vibrant mix of the traditional, the fashionable and the luxurious. It manages to balance and embrace every aspect of the modern and the historical world and this is reflected in the breadth of shopping Seoul has to offer. From towering department stores to traditional markets, Seoul has it all. The city's attractions are spread out across the entirety of Seoul. Some tucked away in far out suburbs, others glittering in the built up city center, but wherever you choose to explore, be assured that Seoul won't disappoint. As a huge 600 year old city, and the largest capital in South Korea it’s no surprise that Seoul is home to a vast array of historical, architectural and natural sites. Seafood, seafood and more seafood defines the Busan dining experience. The real local delicacy is raw fish and visitors are sure to be amazed just how many ways fish can be used without ever being cooked or heated in any way. Busan offers beaches in abundance and soaking up the sun is the main form of recreation here. Other water sports like jet-skiing, parasailing and yachting are popular and the rocky islands off shore make for popular daytrips on chartered boats. Busan is a shopper's heaven, with retailers continually rubbing their hands together as tens of thousands of cashed-up South Koreans arrive in town with holiday money to spend. The central area of Busan is made up of three separate shopping precincts, but they are all so large they have joined together to form one monolithic shopping world. Busan is modern and despite its towering skyscrapers and legions of tourists, quite compact and easy to get around. The underground mass transit system covers every corner of the city and it runs like clockwork. 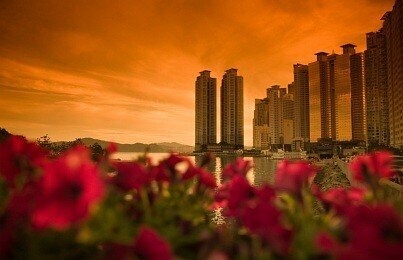 Busan is famous for its beaches, spas and temples. The main beaches can become excessively crowded in summer and on most weekends of the year, while the enormous health spas  one claims to be the biggest in Asia  manage to fill up despite operating cavernous facilities over multiple stories. Featuring a vibrant, multicultural atmosphere, visitors to Seoul are sure to receive a warm welcome. Getting around Seoul is simple as there are plenty of buses and underground stations located near most major attractions. Visitors will also find plenty of familiar aspects here such as bars, restaurants and theme parks. Seoul is a real shopper's paradise as it features a large number of modern shopping malls as well as large street markets where a wide range of products can be purchased cheaply. Seoul is much more than simply cosmopolitan city, in amongst the crowded streets visitors to Seoul will discover a wide array of historical sites, which include old royal palaces, markets and ancient temples. People from all over Korea travel to Seoul to party, shop and play sport and visitors from all walks of life will find plenty to do here. Whether you want to play golf, enjoy the vibrant nightlife or watch a play at the theater, Seoul has something for everyone. Koreans love to eat and dining out is a big event in Seoul. While there are plenty of gourmet restaurants to be found in the city, diners can also choose from a wide range of Western restaurants as well as street carts.